My parents long ago devised a system of “governance” for our family activities, joining an acute awareness of physical and mental health with a passionate embrace of the great outdoors. During my adolescent years, I deemed myself a “victim” of this worldview, committed to protesting their preferences in favor of an appreciation for the “great indoors.” I considered myself steadfast and advanced in the art of opposition: at a remote trailhead, I cunningly revealed that I had left my hiking boots in our motel room; in 95-degree New Hampshire heat, I adamantly refused to replenish myself with Gatorade or smashed peanut-butter-and-jelly sandwiches; and nearing many a summit, I vociferously declined to conquer my fears of heights, narrow rock “chimneys,” or mountaintop “fire towers” that offered stunning New England vistas. This past summer I discovered that I had finally made the quantum leap from “group sweep”—a euphemism for the most sluggish team member—to on-trail leader. I had unconsciously “grown up” in the backcountry of New England, and was primed to take another forward step in my transformation. Compelled by the prospect of liberation from my “backcountry blues,” I assumed the role of leader over 93 miles of craggy mountain peaks in the northern Dolomites. On a simple level, the experience of providing leadership to my family answered some of my earlier uncertainties about the rationale of spending so much time in the midst of remote, glacier-fed lakes, serene Maine moose, and the solitude of snowy pine forests. But perhaps more significantly, in this process of growth and reinterpretation, I finally understood my parents’ “call to the wild.” The tears and force-fed sandwiches had facilitated this natural maturing process; with a fundamental appreciation for the beauty and mystique of the great outdoors, I could now realize self-expression and self-reliance in forthcoming expeditions. I had morphed into an on-trail chameleon: early riser, stoic leader, blister technician, and linguistic enthusiast. Encountering the white dragon on Italy’s Alta Via 1. Photo: AK, 06.2009. In this latest installment in the ongoing series of Kramer family outdoor excursions, I finally closed the childhood chapter of “dragging my feet” and recurrent “umbles.” On a snowy ridgeline, I chased after two hikers, stoking my command of spoken and written Italian, waving a topographical map in the air, and pleading for a firsthand description of the treacherous trail ahead. At an uncertain halfway point, I found myself yelping into our satellite phone as I conducted my first, full phone conversation in Italian with the proprietor of a nearby mountain hut, gripping the phone with sweaty hands in helpless defense at the absence of body language. And in the final leg of our journey, I mustered my powers of empathy from the depths of my own depleted stores to pull my older brother from his tired, grumpy reverie, a condition scarcely mollified by an emergency Snickers bar. 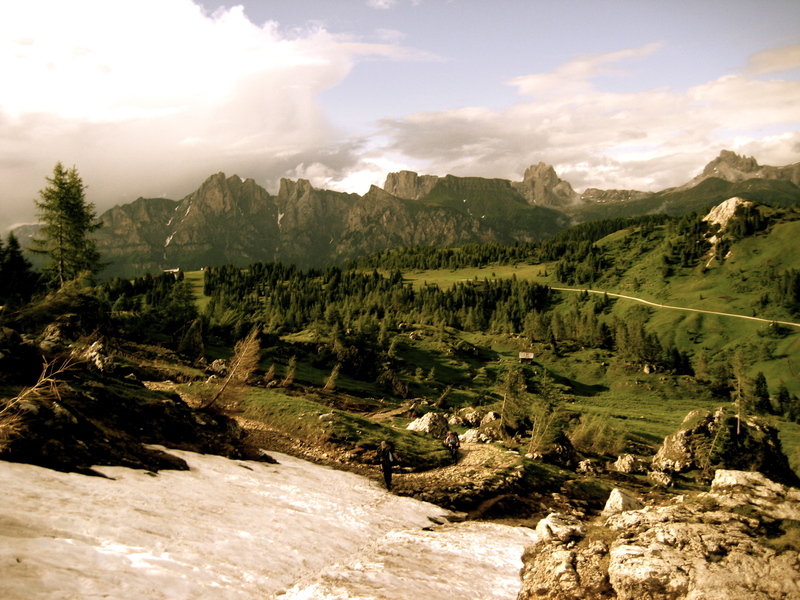 While my conversational Italian will unfortunately prove less practical in my daily routine as a college student, my experience in the Dolomites served as a muse for reflection and future inspiration. During a water break on our third day on the trail, I pulled my dad aside and confided that I was suddenly recognizing the stresses, concerns, and fulfillment of earning a backcountry leadership position. He simply smiled and nodded, leaving me to relish the fruits of this personal zenith, and to stumble upon new challenges that would allow me to synthesize my eclectic tongues and talents in unforeseen ways. Annie Kramer, Alta, Utah, 12.2009.